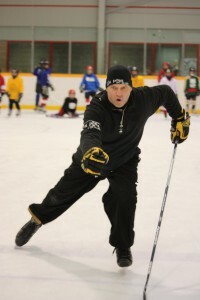 Coaching experience: Eric is a Certified NCCP High Performance 2 Coach with NCCP Level 3 Theory and a Certified Skills Coach from Hockey Canada. As well a Can-Fit-Pro Certified Personal Trainer with First Aid (Trainer 2 certification). He has been one of the most sought-after instructors in the area for many years. His professional coaching includes Canadian University, Junior B, Elite Professional and Junior hockey in Europe, and 20 years with Skills Plus Hockey, along with many years of Minor Hockey Coaching and Training. Eric lectured in the Kinesiology Department on the Theory of Hockey at Wilfrid Laurier University from 2004 – 2015. Scouting Experience: Eric has worked as an OHL scout with the Kitchener Rangers and as an evaluator at many selection camps. Skills Plus instructors are highly trained athletes with a wealth of experience. Our staff has a high level of proficiency and is able to demonstrate each skill at an elite level. We use correct technique, giving our students a good visual image of the different skills being taught. To maintain a successful teaching environment, Skills Plus utilizes a balanced player-to-instructor ratio (approximately 4:1). Coached Kitchener Dutchmen Jr B and Minor Hockey (AAA, AA/A, MD, House League), received 20 year service award from the City of Waterloo in 2004 for dedication in Minor Sports. Graduated with Masters degree in guidance and counseling. Player with the Providence Friar Normore finished her career atop the all-time games played list with 143 appearances, having played in every game during her stellar four-year career. Broke the 20 point plateau all four seasons and finished her career with 91 points on 66 assists and 25 goals.